You know that your mood can affect which foods you crave and when, but did you know the opposite is also true? Ever notice how after a huge meal (think Thanksgiving dinner) you just want to sprawl out on the couch, turn on the TV, and do nothing? Or after consuming way too many sweets you experience a sudden surge of energy, followed by a quick crash later? Or after over-indulging in some fast food, you feel lethargic and dejected? Your mind and your stomach are much more connected than you might think. Quite literally, there is a direct line that sends information from your abdomen to your brain. This nerve, called the vagus nerve, is what makes connections between what you eat and your mental and emotional state. Ever experience “butterflies” in your stomach? That’s the work of some hundreds of millions of neurons that connect your brain to your enteric nervous system, which controls your gastrointestinal system. Because this nervous system operates independently (without guidance from the central nervous system) it is commonly referred to as our second brain. The distinct connection between our gut and our brain makes it important to think about the foods we are eating and how they could affect our mood. Various foods release chemicals that can either encourage a good mood or boost a bad mood. Bananas – Yet another reason to eat bananas. This fruit contains an amino-acid called tyrosine which builds and helps to increase dopamine levels – a chemical that boosts a positive mood. Bananas are also rich B vitamins, which the body uses in times of stress to ease the nervous system. Dark Chocolate – Who doesn’t need another excuse to eat dark chocolate? Dark chocolate contains the neurotransmitter anandamide, which is also known as the “bliss molecule.” This molecule can block feelings of pain and depression and can create a heightened state of happiness. Dark chocolate also contains theobromine, which works to relax muscles. High-Quality Protein – Quality protein such as, eggs, fish, tofu, or greek yogurt helps to slow the absorption of carbohydrates and maintain steady blood pressure levels. Similar to bananas, these high-quality sources of protein can release dopamine, which enhances mood. Soda – This beverage contains simple sugars, which contribute to the brief energy-high you may be familiar with, followed by the sudden crash later. These simple sugars mess with your blood sugar levels and thus, your energy and mood. Processed Lunch Meats – You might think making yourself a ham and cheese sandwich is a healthier lunch option, but odds are your cold cuts are filled with nitrates and preservatives that can contribute to headaches and bad moods. 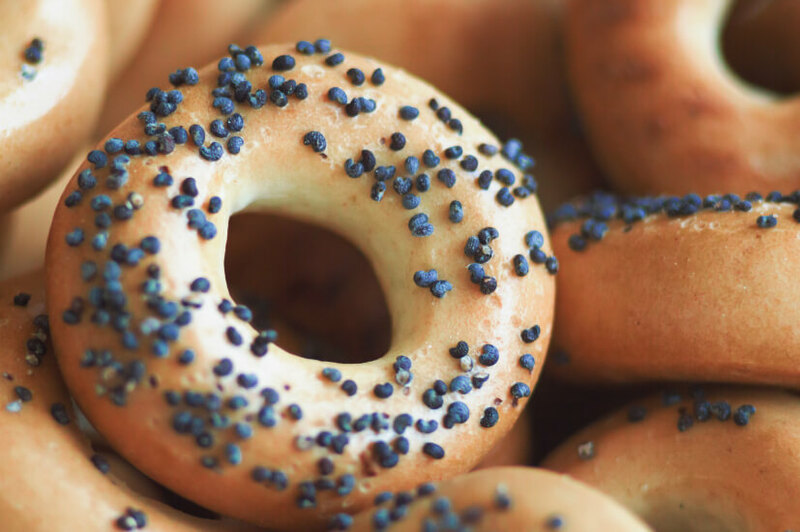 Bagels – Similar to soda, the carbohydrates in bagels burn off quickly in the body and make your blood sugar skyrocket before plummeting. This fluctuation in blood sugar levels disturbs your focus while also contributing to mood swings. It’s clear there are such things as “bad mood foods,” but there are other contributing factors that are within your control as well. While it’s important to be conscious of the food we consume, we also need to take note of when and how often we eat. This might seem trivial, but it can have a major affect on your mood overall. Eat regularly – If you are able, try to eat around the same time each day. This will help keep your blood sugar levels steady. Also, try to fit in healthy snacks between meals. This will ensure that your body has enough fuel to burn during the day to keep you energized. Don’t skip meals – Similar to working in snacks, you don’t want to skip meals as your body becomes less capable of using energy. In addition, you are more likely to overeat or eat poorly at your next meal and bring about a bad mood. Exercise – Exercise relieves tension, decreases stress, increases energy, and fosters overall well-being due to the release of endorphins. Your mood and what you eat are very much connected. Thanks to our “second brain,” a lot of what happens inside the gut affects what happens in the brain. Certain foods can alter our mental and emotional state, either positively or negatively. Try to keep an eye out for processed foods or items filled with simple sugars – these are the worst offenders. Lastly, it’s important to eat regularly and exercise as this will keep your blood sugar levels in check and aid in releasing tension.